Probably the best thing that the Radisson Blu Rome has going for it is its location. We arrived into Rome late in the evening on our flight from Nice, France. We had taken a helicopter (!) from Monaco to Nice and then a short flight on low-cost carrier Vueling into Rome’s international airport. To get from Rome Airport to the city center, we took a Terravision bus, which dropped us right at Rome’s Termini Rail station. We got to the Radisson Blu Rome at around 9pm. The Terravision bus drops you off on the OTHER side of the Termini station, but we were able to walk through the station and then down the street to the hotel. We did have to ask someone for directions, but we also were able to use Osmand to navigate us there even though we didn’t have a wifi signal. We were given a room on the 6th floor, but what we didn’t realize was that it was facing the train station. You can see how close it is, and it woke us up early in the morning. It wasn’t so much the train noise, but the loud repetitive loudspeaker announcements. I wish I could remember the exact thing it broadcast (LOUDLY… OVER… AND…. OVER…), but it was a few months ago, and it was in Italian so I didn’t understand it anyways. The upside of the Radisson Blue Rome hotel location is, again, how close it is to Termini station – that is where the 2 lines of Rome’s subway come together, so you can easily get just about anywhere you want. It is also within walking distance to many of Rome’s attractions – we walked down to the Colosseum, Forum and Palatine Hill, which are about a mile away. This was one of the hotels we booked with our stash of Club Carlson points after they eliminated the Bonus Night feature of their co-branded credit card. The Radisson Blu Rome hotel runs for 50,000 points / night, though in our case, it was 50,000 points for 2 nights. The room at the Radisson Blu Rome was not like most hotels out there. It was decorated in a modern style, which really isn’t my thing. When I asked Carolyn what she thought about the Radisson Blu es. hotel room, she just remarked that it wasn’t comfortable. It was a “premium” room so in theory larger than the other rooms at the hotel, though at 25 square meters it was not large by any stretch of the imagination (though I understand that’s fairly typical in Europe). One think I thought was weird was that there was only a glass wall separating the bathroom (including shower and toilet) from the main room. The Radisson Blu Roma hotel has a rooftop pool which I was actually pretty excited about – I thought it would be fun to swim on a rooftop, but the pool wasn’t anything special and in fact was downright FREEZING! Even the hot tub was tepid at best. Have you ever stayed at the Radisson Blu Roma? How was your stay? Are you as unimpressed as I am with Radisson hotels around the world? Club Carlson hotels are generally mediocre to lousy. I’m going to gamble on a stay at May Fair in London in Sept. This is the gem of the Radissons, but doesn’t get stellar reviews online. Glad they got rid of the 2 nights for the price of 1 credit card benefit–gave me an excuse to clear this card from my stash. I’ve been to the May Fair, and I wouldn’t go back. It was interesting to get a feel for what Carlson has as a flagship property, but it just wasn’t a luxury hotel. I had a much better time at one of the other Edwardian Group properties. If you’re doing this for bragging rights, then by all means do it. But don’t expect great things. My husband and I stayed at the Radisson Blu Alcron in Prague about a year and a half ago. It was wonderful. We did pay the extra points for an upgrade room that also included breakfast. The breakfast was stellar and the room was large, with a very nice bath and balcony. Another Radisson Blu we like is in Chicago. Rooms are only ok but the gym facilities are the best I’ve ever seen in a hotel (because they are shared with condos in the same building), the location is fantastic and the building is very unique. Stayed there a couple years ago. The pool is nice when it is warm out. Location is good, but make sure you have a map or GPS, it hard to find from the station without. one thing about the room: the shower is somewhat in the middle of the room,. 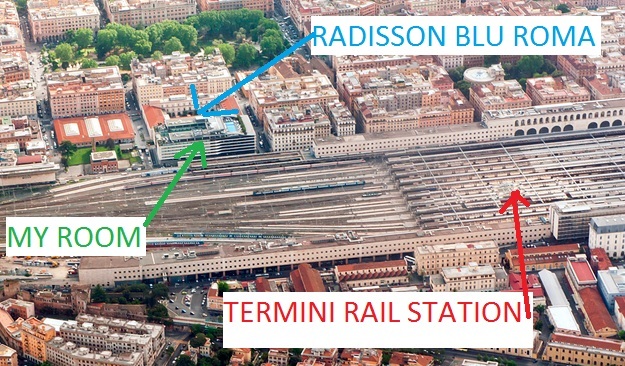 “Probably the best thing that the Radisson Blu Rome has going for it is its location.” I don’t really understand how a hotel close to the train station can be good unless you will be using that as a base for you to travel by train for the day and return to Rome. Train stations in Europe are usually not a nice place to be around. There are several other better hotels in Rome and way better located. 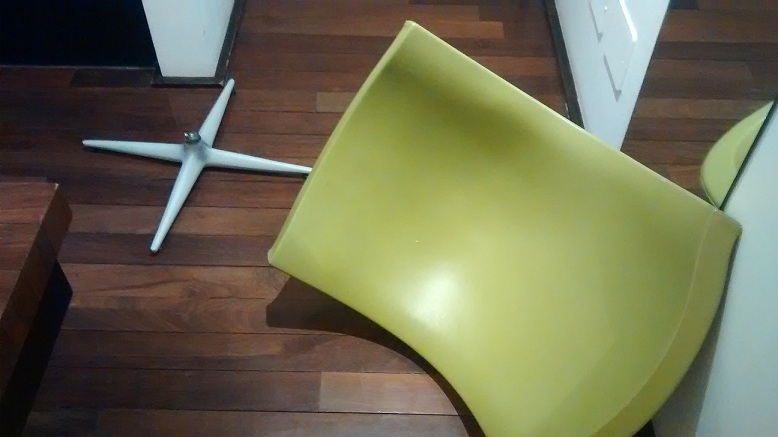 The last room room, including the furniture, was filthy (the green or orange chair was almost black with dirt), and we found what we assume was a housekeeping staff’s badge and some other trash between the mattress and bed frame. The toilet had not been cleaned and toilet paper in it. There was only towels for one person. Nothing we used the first night was replaced when housekeeping came the second day (towels, coffee, etc.). After settling into our final room, we spoke with housekeeping in the hallway and asked why the room was so hot and wondered why the air conditioning had not kicked in yet despite the thermostat being set to below 20 degrees Celsius. We were told that they only provided hot air, not cold air, and that if we wanted it to be colder we should open our window. Without any other option, we opened the window, and after we left it open for 24 hours our room was still incredibly hot to the point of sweating (this was in mid November). We did not sleep well at all the two nights we were there. Not to mention that the hotel is in a busy neighborhood right next to the main train station in Rome, and was very loud with the window open. In the end I emailed Club Carlson customer service, they contacted the hotel on our behalf, and all of our points were refunded, but the hotel never said a word to us about all of our complaints or the refund. I have also never been to a an excelent Radison Blu. Some are okay, but many are bad. My “favorite” bad Radison Blu was the one in Bucharest. So if you travel to Bucharest, do not choose Radison. We stayed at the Radisson Blu Bangkok last month in a club level room and it was awesome! The included breakfast was the biggest, best buffet I’ve ever tasted! The rooftop pool was very nice, the room was large and comfy with a huge bathroom. Its the only Radisson Blu I’ve stayed in but it’s very good…. So at least there’s one good Radisson out there. That sounds fun! Did you have to pay extra to get a club room? Or were you upgraded for status? I reserved 2 nights for 57000 when they had the second night free deal. I had a free night e-cert for the third night and the only way they let me stay in the club room was to pay $45 extra. The e-cert only goes towards a regular room. I was disappointed in that. I only have gold status though. So for 3 nights it cost me 57000 + $45. Their breakfast was amazing, the tea and apps at 2:30pm was our light lunch and happy hour from 5:30-7:30 was our dinner and free drinks. Basically, we never ate out while in Bangkok! A few of the Radisson Blue hotels in the Nordic countries aren’t bad–that’s really their base of strength (Norway, Sweden, Denmark, Finland)–but the brand is hardly comparable to a Westin or even a really, really good Marriott. I’ve never had a good experience at a Radisson in the U.S. Nobody I know–I have lots of business traveler friends who do 150-200 nights per year in hotels–stay in Radisson hotels. Frankly, I don’t see any difference between a Holiday Inn and a Radisson. In fact, I’d rather stay at a Holiday Inn because while IHG points are inflated like Club Carlson points, IHG has Intercontinental. In London, I’d take a Park Plaza over a Radisson or Radisson Blu. There are a couple within walking distance of Westminster Palace. The one by Lambeth on the Albert Embankment has great views of the River Thames and is, at most, 10 minutes from the tourist sites by foot. It’s a little tired–or was when I was there in November–but it’s under renovation and can be booked super cheap on points. Plus, they generally give breakfast to golds. In London, my go-to hotels are the J.W. Marriott Grosvenor House and the Marriott London County Hall. Regarding US Radisson Blu’s… You should come stay at the Chicago Radisson Blu. It was rated Carlsson Rezidor’s best property in the US, and it truly is a wonderful hotel. My experience at Radisson Blu Bangkok, like the one above, was amazing. We walked from the train to the wrong Radisson, and that hotel graciously took us to the correct hotel in their Tuk Tuk! The staff was very polite, offering up directions at breakfast (amazing breakfast buffet, as noted – definitely worth it!!!) and I received both my points and an upgraded room for our two nights there, booked with the 2 for 1 points bookings. I cannot recommend this hotel enough.